Two weeks ago I posted the last document I have that is directly associated with Jean La Forêt, a letter from his daughter Adrienne. After going through the files I created for the other individuals in my "treasure chest", I decided the next logical person to work on is Jean's younger daughter, Rosita. She has been discussed in some posts previously, but always as a secondary person in a document or photograph. These documents are really about her, although I don't have many. 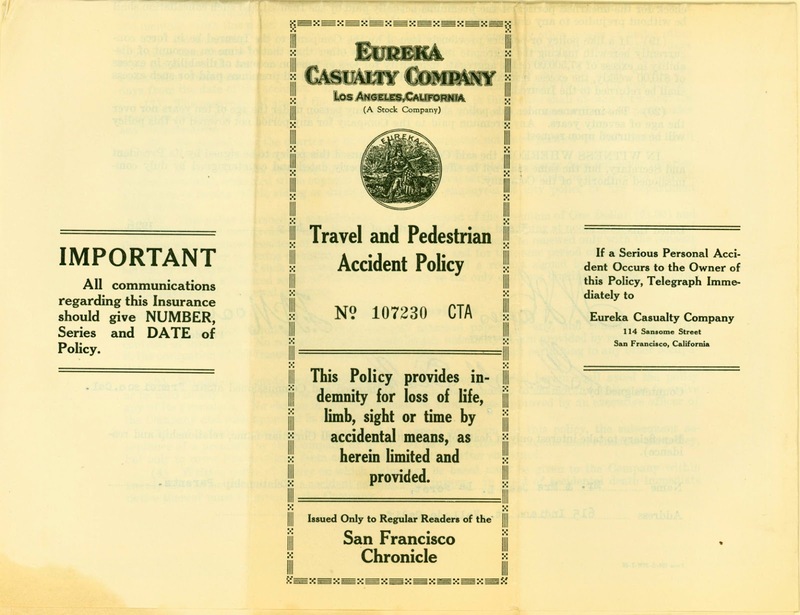 This is a "Travel and Pedestrian Accident Policy" for Rosita E. La Foret. The full sheet of paper is 22" x 17", designed to be folded into quarters and then thirds, of a size to fit into a standard business letter envelope. It's currently off-white in color with some stains that look like grease. It's about the weight of 20# bond and has no watermarks. 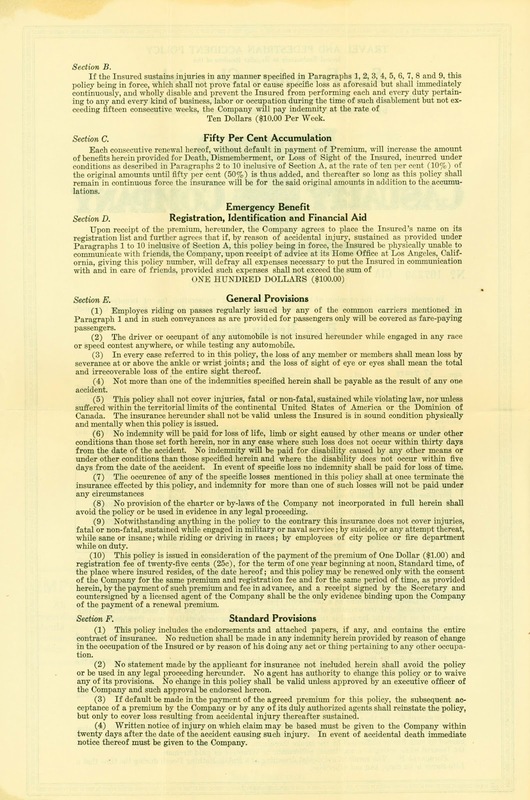 Almost everything on this policy is preprinted, with the exceptions of Rosita's name, age, and address on the first full, "title", page and the date, signatures, location, and beneficiary information on the third full page. 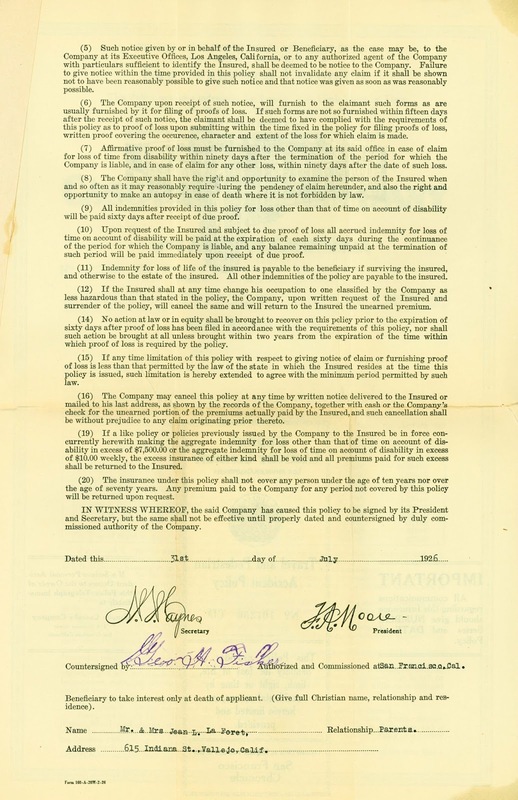 All nonprinted information except the signatures has been typed. The signatures appear to be stamped; they have no texture and do not appear to have been signed by hand. Geo. A. Fisher's name has been stamped twice, with one instance offset from the other. 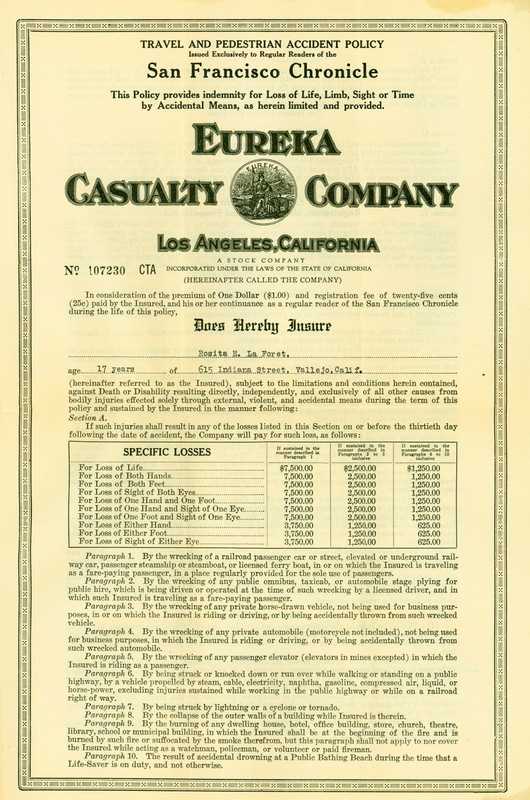 There's no indication of any specific event for which this insurance was bought. Rosita was 17; maybe she was going on a trip? It is a travel policy, after all. The address for her and her parents is the one we have seen before, 615 Indiana Street in Vallejo. 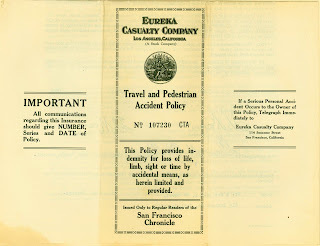 The policy is dated July 31, 1926, less than two months before Jean passed away. The policy itself goes into a lot of detail about how much it pays and under what circumstances. On the first full page, I find it surprising that the amount for loss of life of the insured is the same as loss of two body parts. 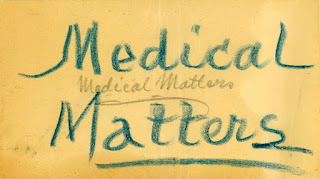 You'd think it would be more if the entire body was out of commission. 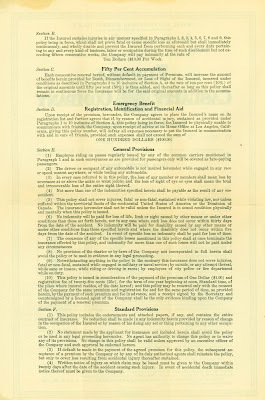 And the circumstances which are covered are specifically described: "wrecking of a railroad passenger car or street, elevated or underground railway car", "being struck by lightning or a cyclone or tornado", "collapse of the outer walls of a building Insured is therein" (but apparently not the inner walls? 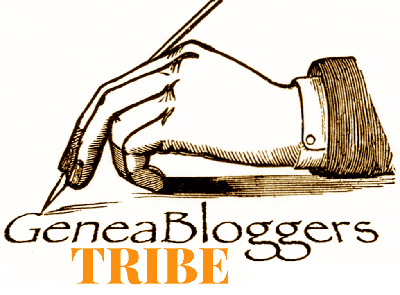 ), "result of accidental drowning at a Public Bathing Beach during the time that a Life-Saver is on duty, and not otherwise", for a few examples. 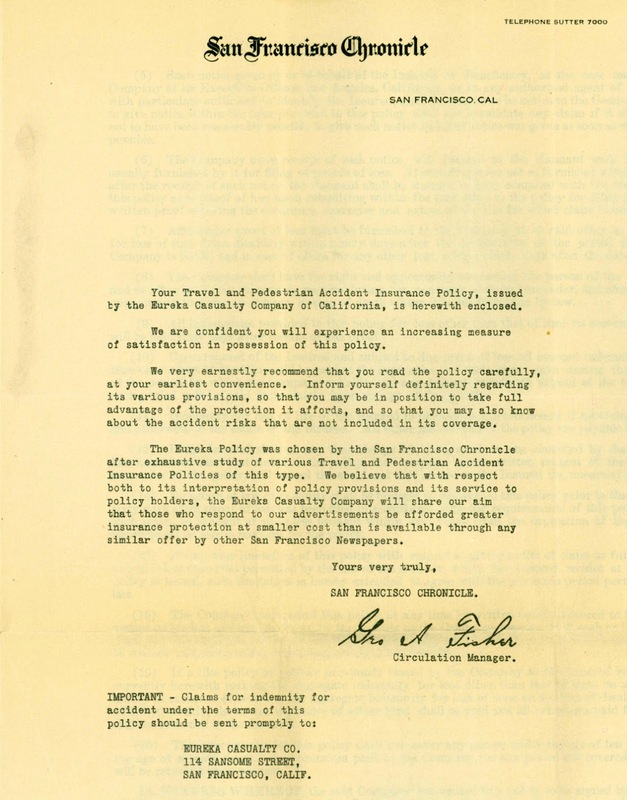 The policy cost only $1, plus $0.25 to register it, and also depended on the insured being a "regular reader" of the San Francisco Chronicle. I had no idea that newsapers sold insurance policies. 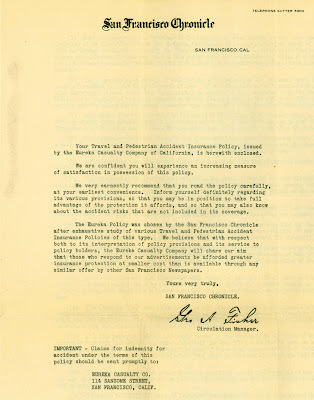 Since it did not specify the insured needed to be a subscriber, I wonder if I could go to the library and read the Chronicle and still qualify. 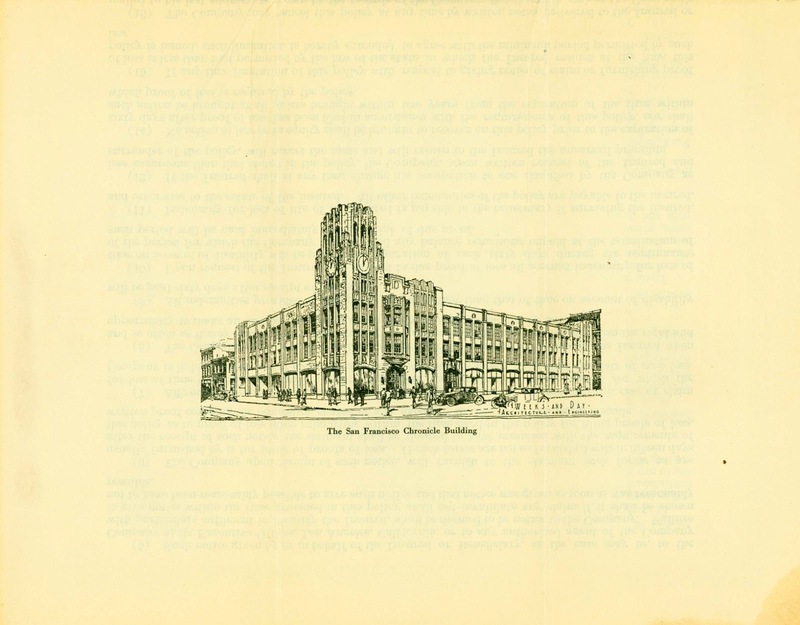 The Chronicle was pretty proud of its building. 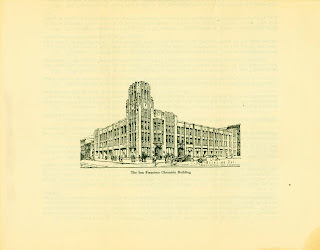 It included an image of the building on the back of the policy. 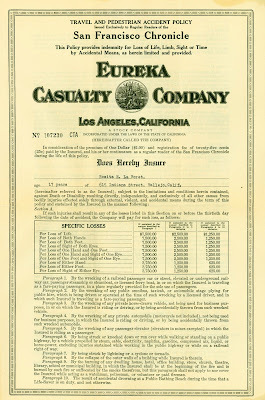 The insurance was through Eureka Casualty Company of Los Angeles, which had a local office in San Francisco on Sansome Street. I didn't find much information about the company online, but several of the hits from my Google search were for lawsuits against Eureka. I guess it's a good thing that it doesn't look as though Rosita had to try to collect on the policy. This letter is on a sheet of 8 1/2" x 11" paper. It's a grayish white; it might have been white originally. It is about 20# and has no watermark. 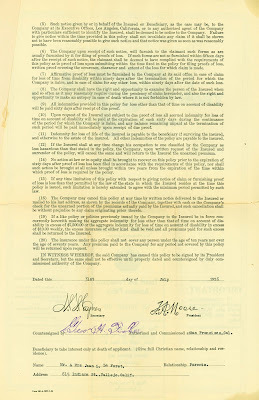 It is glued into the policy over the signature page. It was printed, not typed. I'm not sure if Geo. A. Fisher's signature was printed or stamped. This version of his signature looks different from the one on the policy. I wonder if either version was actually signed by him. This is a pretty standard cover letter. (Apparently not much has changed in 90 years.) I am amused by the second paragraph: "We are confident you will experience an increasing measure of satisfaction in possession of this policy." That's funny, I would have thought policy-holders should experience greater security or maybe safety. I never thought about being satisfied that I had an insurance policy. This envelope is 6 1/2" x 3 5/8". It scanned much yellower than it is; the true color is a medium grayish-white. 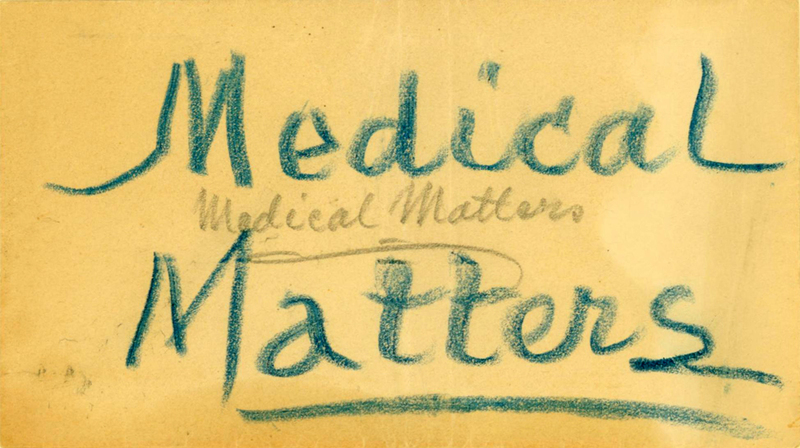 It has "Medical Matters" written on it twice, once in pencil and once in what looks like blue crayon. This was tipped into the folded insurance policy. It's too small for the policy to have been in it at any point, because there would be more fold marks on the policy. I don't know what its relevance is to the policy. Maybe it just ended up there over the years.